both are very gentle and nourishing for your skin. One kind is cold process, which is one third goat milk and comes with natural scents such as lavender, rosemary, spearmint and rose hips to name a few. The other type is a glycerin/goat milk combination which has 10% goat milk, and comes in a variety of colors, scents and shapes. 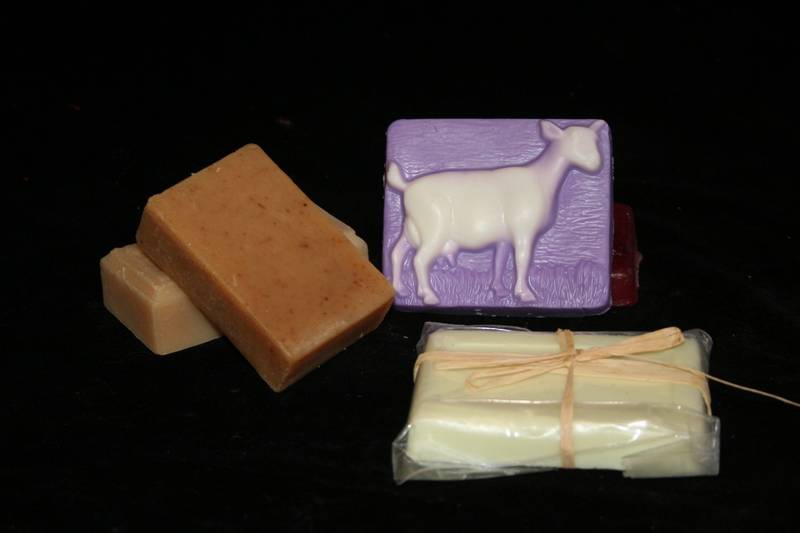 Our Nigerian Dwarf goats supply the fresh milk for our soaps and hand creams. Nigerians have the highest butterfat percentage in their milk, and this extra rich milk makes our soaps exceptionally mild for the skin and helps to nourish the skin as well. *All of soap products are made in small batches and hand cut, trimmed, and wrapped. Due to the nature of hand making soaps, there will be some variations in color and sometimes slight variations in scent. Our soap cost $1.00 per ounce in aprox 4 ounce bars. available in many scents cost is $2.00 per ounce in 4 ounce bottles. Aloe and Vitamin E, Steric Acid, Emulsifying wax, Germaben and natural fragrance. Goat’s Milk because goat’s milk does not contain the complex proteins that are believed to be the main stimulate of allergic reactions in cow’s milk , we think this is why it adds thick rich creaminess. Distilled water is evaporated water so it has none of the impurities and microbes that tap water has. Shea Butter; is used to heal small wounds, burns and skin ulcers. It moisturizes and nourishes the skin. Mango, Apricot and Almond Oils are renowned for there rich concentration of fatty acids which help to give penetrating and restructuring properties. They nourish, moisturize, soften, soothe and condition skin. Avocado Oil is high in protein and vitamins A, D and E which help heal scaly, dry skin. It is good for extremely sensitive skin. Aloe and Vitamin E which are both well known for their qualities of healing and moisturizing. Emulsifying Wax is what bring the water, milk and oils together and makes the cream. Steric Acid (taken from a vegetable source) is what adds a pearlescent quality to the cream. Germaben is a preservative that helps keep bacteria from growing.